Bentonite is naturally occurring minerals of montmorillonite group with thixotropy, decolorizing and absorbing properties. Chemical name of Bentonite is "Naturally occurring hydrated aluminum silicate (Al2O3. 4SiO2. H2O)". There are two types of Bentonite viz., swelling and non-swelling types are commonly known in trade. Sodium Bentonite is of swelling type while Calcium Bentonite is non-swelling. Bentonite is believed to have been formed by the alteration of volcanic ash deposited into shallow seas about 100 million years ago. The Bentonite found in Kachchh region of India is of igneous origin, due to the natural characteristic of these particular volcanic ashes, the chemical composition of this Bentonite is somewhat different from the Bentonite available in the rest of the world. Most of these deposits are of natural sodium Bentonite with higher iron content which gives them their darker color. Due to very fine particle size, this Bentonite shows extra-ordinary swelling capacity and bonding powers. These differences mean that the Kachchh Bentonite finds the most number of uses in various industries throughout the world. Foundry Grade Bentonite is very selected Bentonite of Kachchh region, this Kachchh region of India is of igneous origin and so that its show extra ordinary swelling capacity and binding properties. Our Bentonite gives good Flow ability, Compact ability & Thermal stability for high quality castings. Our special grade Bentonite powder provide high GCS & WTS which are increasing the Strength of Mould. We provide good gelling time which give high strength in less mulling time and increase production capacity. We also making our grade as per customer specifications as well as the casting method which gives ZERO casting defects. Bentonite is used as Lubricator / thickener for drilling fluids. Drilling mud is crucial in the extraction of drill cuttings during the drilling process. Bentonite, when mixed with water, forms a fluid (or slurry) that is pumped through the drill stem, and out through the drill bit. The bentonite extracts the drill cuttings from around the bit, which are then floated to the surface. The drilling mud, or gel, also serves to cool and lubricate the drill bit as well as seal the drill hole against seepage and to prevent wall cave-ins. Our Drilling Grade Bentonite Powder serve a verity of function lubricating drill bits, stabilizing well bores removing rock cuttings and improving drilling efficiency. Drilling mud or drilling gel is a major component in the well drilling process. IOP Bentonite is used as a binding agent in the production of iron ore pellets. Through this process, iron ore fines are converted into spherical pellets, suitable as feed material in blast furnaces for pig iron production, or in the production of direct reduction iron (DRI). We are maintaining the high Green Compressive Strength and high Plate Water Absorption of our Bentonite for better strength in binding. We develop special product for Civil Engineering & Pile Foundation. Our specially processed Bentonite improves the concretes workability, aggregate dispersion and impermeability without decreasing its strength, Provides good trench stabilizing properties during excavation phase, prevents slumping of cement and soil particles during curing phase, increases the water inhibiting properties of the wall. When our Bentonite is dispersed in water, immediately starts a rheological reaction that produces a highly colloidal suspension with excellent holding, sealing and lubricating performances which achieve their highest level in 24 hours. 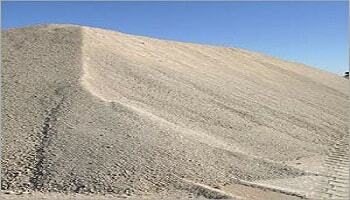 Our Bentonite which is used for rehabilitation of landfills to ensure the protection of ground water from pollutants. When our Bentonite comes into contact with water it expands, strengthening and becoming water-proof. It is used as a base for the lining or sealing of a landfill to prevent the leaching of contaminants into the surrounding environment. This in turn prevents water systems from being contaminated by toxic chemicals which could fatally harm humans and animals alike. Natural erosion occurs from a variety of factors including weather and farming. It occurs from farming when crops are continually planted year after year. This process eventually leads to soil degradation and decreased crop production. The International Water Management Institute had found bentonite clay as a solution to soil degradation. One major side effect of erosion and soil degradation is the inability for the land to retain water. They found that when bentonite clay is mixed with farming soil, it increases water-retention and thus the ability for crops to access water. Farmers benefit from its low cost and wide availability. Application of Bentonite clay technology made a big contribution to rejuvenating the degraded soils and it has improved yields and farmers incomes. It is used as an ion exchange for improvement and conditioning of the soil. When thermally treated, it can be used as a porous ceramic carrier for various herbicides and pesticides. We offer Bentonite powder as well as granular Bentonite for agricultural uses. Bentonite is used as a binder in the production of animal feed pellets and as a digestive aid, it can also be used as a flow ability aid for unconsolidated feed ingredients such as soy meal. Bentonite is also used as toxin binder in livestock and poultry feed. Problems of aflatoxin contamination of animal feed are common around the world. The principal crops affected are corn, peanuts, cotton. Toxin production is dependent on factors associated with growing conditions of the crop as well as the storage condition of the crop. Our bentonite products are able to prevent much of the adverse effects associated with ingestion of aflatoxin - contaminated grains. Our bentonite addition to an aflatoxin - contaminated diet is beneficial in restoring some of the lost feed intake associated with aflatoxin ingestion and, as a result, some of the lost growth rate. The inclusion of bentonite improved the clinical chemistry profile indicating a protective effect on the liver. Few studies have provided evidence that the clay products were themselves making nutritive contributions but most have demonstrated an improved caloric efficiency resulting from their use.